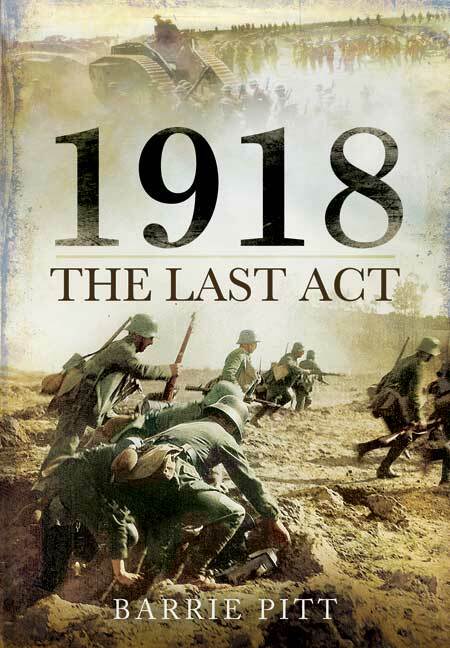 You'll be £16.99 closer to your next £10.00 credit when you purchase 1918: The Last Act. What's this? Order within the next 2 hours, 57 minutes to get your order processed the next working day! By 1918, after three years of war, Europe was weary of the stalemate and the terrible slaughter on the Western Front. The Russian Front had collapsed but the United States had abandoned her neutral stance and joined the Allies. So the stage was set for what would be the last year of the Great War. Acclaimed military historian Barrie Pitt describes the savage battles that raged unceasingly along the Western front, and analyses the policies of the warring powers and studies the men who led them. From the German onslaught of 21st March 1918 - the Kaiser's Battle designed to force a resolution before America's armies could tip the balance - through the struggles in Champagne and the Second Battle of the Marne to the turning point in August and final victory, the author gathers together scattered material to make an enthralling book. There are some striking maps throughout the book, including the Flesquieres Salient, the German plan of attack of March 1918, as well as the last German offensive and counterattack of July 1918, and the Battle of Amiens of August. The whole progression of action as it progressed on the Western Front throughout 1918 is developed in great detail, with coverage of the German Offensive in the spring, to eat shifting of the balance during the summer to autumn. Very helpful diagrams are included, such as planned construction of trenches and lay out. The book is a pleasure to read and a wonderful summary of an eventful year. I highly recommend it. Barrie Pitt is an exceptional writer, a thorough historian and a master of drama. In his book The Last Act 1918, he vividly describes the events and characters who shaped the final year of the Great War. His depiction of the battles is so clear and vivid that the reader can feel himself transported through space and time to the actual moment of the event. With a keen attention to detail, the author describes every aspect of the battle from the decisions taken by top commanders, to firsthand accounts of the soldiers inside the trenches. The author devotes enough pages to major players in that fateful year, such as the Kaiser, Haig, Foch and Ludendorff so as not to leave the reader wanting as to who were the people who had in their hands the power to decide the fate of millions. In its 12 chapters, the book explains the circumstances and events at the frontline, at home and in the minds of the generals and politicians which lead to the series of German spring offensives and the ultimate defeat of the Axis powers. The 16 maps and illustrations perfectly complement the story. The best parts of the book are the ones dealing with the generals, the relations between the allies, the weapons used and especially the tanks and finally the epilogue which showed how the popular opinion viewed the heroes of the war after 1918 and how the different countries reacted to the outcome of the war. I highly recommend this book to anyone who enjoys history books and especially fans of the Great War. This book was first published in 1962 and was one of the first books to specifically tackle the events of 1918. A concise introduction summarises the events of the war up to the beginning of the year, with an examination of the situation on the western and home fronts, before launching into the chronology of 1918. A well-written work that takes the reader through the sometimes complex manoeuvres of both fighting forces. If you only read one book on the last year of the Great War, make it this fine tome. Author Details Barrie Pitt is a distinguished military historian, and is the author of The Edge of Battle, Churchill and the Generals and Special Boat Squadron.